AnyMP4 Free PDF to PNG Converter for Mac is the professional and free software to help Mac users to convert PDF to PNG without any quality loss. And you can enjoy the converted files on many portable devices like iPhone 5, iPad mini, iPad 4, Samsung Galaxy S4 and others. Besides, with this powerful program, you can preview any page of the whole original PDF file according to your needs, and you can also choose any page range you want to convert as you like. This Free PDF to PNG Converter for Mac is so easy to use that enables you to finish the whole processing with only a few minutes. AnyMP4 Free PDF to PNG Converter for Mac is the best Mac PDF to PNG Converter, which has the ability to convert PDF to PNG with rather high output quality. 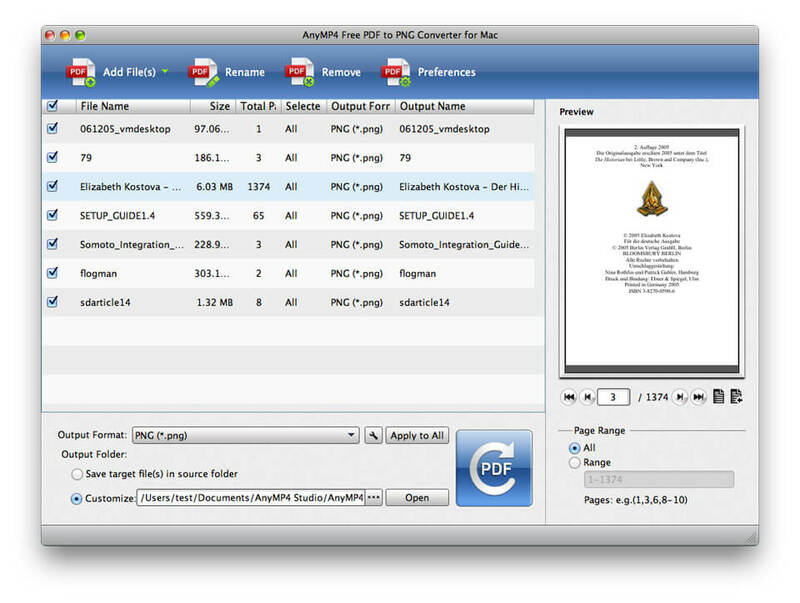 With AnyMP4 Free PDF to PNG Converter for Mac, you can preview the source PDF file freely before converting PDF to PNG. At the bottom of the Preview area, you can choose any page of the source file, and this software allows you to open PDF file with PDF Reader, which is able to help you preview the file clearly. This powerful PDF to PNG Converter allows you to the whole pages to convert, also, this excellent program enables you to choose any page range that you need to convert, and you can set current page as the output page as you like. This program will bring you an amazing experience. This Free PDF to PNG Converter for Mac supports batch conversion that is capable of converting more than one PDF file to PNG image file at the same time for Mac users. Also, you can remove or rename the PDF file if you are not satisfied with them. And you can choose to save target file(s) in source folder or customize the output folder according to your needs. Moreover, this program supports to upgrade automatically, and you can choose to Check for Updates Automatically for Every Week, Every Day or Every Month.